Thrust and Parry: Conductor Marin Alsop pushes the limits of modern classical music at the Cabrillo Festival of Contemporary Music in Santa Cruz, July 29-Aug. 13. WITH ALL of the area's symphonies and orchestras gearing up for their fall seasons, the summer is given over to large, concentrated festivals. The big four provide a chronological journey through the peaks of classical. The Carmel Bach Festival concentrates on its Baroque namesake with forays into Handel and this year's birthday boy, Wolfgang Amadeus Mozart. Midsummer Mozart Festival, which peregrinates from Santa Clara to San Francisco, Berkeley and Sonoma in July, devotes itself exclusively to the man Salieri loved to hate. This year's edition of [email protected] wishes the composer a happy 250th by pairing his music with sympatico composers from other eras. In a very different vein, the Cabrillo Festival of Contemporary Music in Santa Cruz seeks out the best in cutting-edge modern classical music. Carmel Bach Festival July 15-Aug. 5 in Carmel and Pebble Beach; tickets run $20-$72; 831.624.2046. The festival, which turns 68 this year, spreads more than 50 concerts over three weeks and four venues: The Sunset Center, All Saint's Church and Carmel Mission in Carmel and the Church in the Forest in Pebble Beach. The concerts run daily, and programs repeat each week. Bruno Weil conducts. The noteworthy events this year: Bach's Cantatas no. 137 and no. 140 and St. John Passion; Handel's Israel in Egypt oratorio; and Mexican Barque choral music of 16th, 17th and 18th centuries performed in the Carmel Mission. [email protected] July 24-Aug. 11 at the Menlo School in Atherton and St. Mark's Episcopal Church in Palo Alto; see the website (www.musicatmenlo.org) for ticket information. Now in its fourth year, David Finckel and Wu Han's festival salutes Mozart with a three-week series of concerts featuring guest artists and intriguing, educational programming. The program called "Mozart and the Piano" traces the influence of Mozart on Schubert's Fantasy for Piano and Dvor·k's Dumky Trio. In a real stretch, another program pairs the "ecstatic joy" of Mozart's Piano Quartet in G Minor with Shostakovich's tortured Piano Trio no. 2, dedicated to a victim of the Stalinist purges. Midsummer Mozart July 20-30 at Mission Santa Clara, Herbst Theatre in San Francisco, First Congregational Church in Berkeley and the Gundlach Bundschu Winery in Sonoma; $20-$60; 415.627.9142. When Symphony Silicon Valley wants to do Mozart right, they call on guest conductor George Cleve, who led the symphony and its chorale (with help from the San Jose State University Concert Choir) in the composer's monumental Requiem in D Minor in March, heads up the Midsummer Mozart festival. Program I (July 20-23) features the so-called Posthorn Serenade and the Concerto for Piano no. 9 (Program I), with superstar pianist André Watts. Program II encompasses Symphonies no. 39, 40 and 41 (Jupiter). Cabrillo Festival of Contemporary Music July 29-Aug. 13 at the Santa Cruz Civic Auditorium and Mission San Juan Bautista; tickets go on sale June 15, call 831.420.5260 for details. The highly regarded new-music fortnight enters its 44th season; Marin Alsop, taking time off from preparing for her first season as the music director for the Baltimore Symphony Orchestra (making her the first woman in charge of a top U.S. symphony), conducts. The most intriguing entry is a commissioned score by minimalist Philip Glass; it will be accompanied by images from nature photographer Fritz Lanting. Some of the premieres scheduled include Thomas Adès' America—A Prophecy, Aaron Jay Kernis' Newly Drawn Sky and Laura Karpman's Transitive Property of Equality. 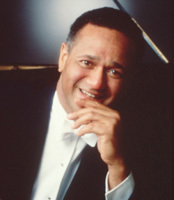 High-Wattage: Famed pianist André Watts is the guest soloist at this year's Midsummer Mozart festival in late July. Chanticleer June 3 at 8pm; St. Joseph Cathedral Basilica, San Jose; $25-$42; 415.252.8589. The premier male vocal chorus in the area has put together a somber concert called "La Guerre: Triumph and Tragedy of War (Victoria!)." Four works by 16th and 17th century composers are scheduled: Janequin, Victoria, Guerrero and Padilla. Montalvo Arts Center Villa Montalvo, 15400 Montalvo Rd, Saratoga; 408.961.5858. Summer at the old Phelan estate in the high-rent district of Saratoga is usually given over to pop favorites, but a couple of classical shows are penciled in. Hunky violinist Joshua Bell, who was heard on the Ladies in Lavender soundtrack, performs Aug. 18 at 8pm at the Garden Theatre. Opera San José June 3 at 8pm; California Theatre, 345 S. First St, San Jose; $40-$60. The company does no productions over the summer, but it does host a recital (with help from the Montalvo Arts Center) by baritone Thomas Hampson, who performs classic American songs, hymns and spirituals. The Peninsula Symphony May 19 at 8pm; San Mateo Performing Arts Center; May 20 at 8pm; Flint Center, 211250 Stevens Creek Blvd., Cupertino; $27-$32; 650;941.5292. The symphony wraps up its season with a concert called "American Traditions." That means works by Aaron Copland (Fanfare for the Common Man), Gershwin (Rhapsody in Blue) and Morton Gould (Amber Waves). Redwood Symphony May 21 at 3pm at Temple Beth Jacob, 1550 Alameda de las Pulgas, Redwood City; $10-$20; 650.366.6872. The symphony explores the world of Jewish composers, including Copland, Bernstein, Weill and Golijov. The symphony will also perform with Schola Cantorum on June 11 at 7pm at the Congregational Community Church in Sunnyvale. The program showcases Bruckner's Mass in E Minor and Vaughan Williams' Dona Nobis Pacem. San Jose Chamber Orchestra May 21 at 7pm; Le Petit Trianon, 72. No. Fifth St, San Jose; $20-$40; 408.445.9300. For the orchestra grand finale, Barbara Day Turner conducts Verkl”rte Nacht by Schoenberg, and Al ColÛn and Summertime Blues by guest violinist Jeremy Cohen. San Jose Symphonic Choir May 20 at 8pm, Sherwood Hall, Salinas; May 21 at 3pm and May 22 at 8pm at Sunset Center, Carmel; 831.624.8511. The choir heads south to join the Monterey Symphony for three performances of Carl Orff's Carmina Burana, conducted by Marx Bragado-Daman. 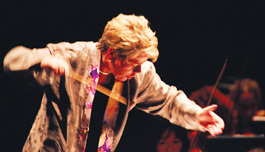 San Jose Wind Symphony May 21 at 3pm; Milpitas Community Center, 457 E. Calaveras Blvd, Milpitas; $10-$11.50; 408.927.7597. The theme is Westerns, as Edward C. Harris leads the symphony through Copland's Billy the Kid, Morton Gould's Cowboy Rhapsody and some oater soundtracks. The Santa Clara Chorale June 2 at 8pm; Mission Santa Clara, 500 El Camino Real, Santa Clara; $15/$20; 408.369.1289. Before heading to Europe for a singing holiday, the chorale adds its voices to the Wolfgang celebration with a concert called "In the Footsteps of Mozart." The program includes the Great Mass in C Minor along with the premiere performance of local composer Pamela Layman Quist's Requiem for the People. Stanford Symphony Orchestra July 22 at 8pm; Dinkelspiel Auditorium, 471 Lagunita Dr, Stanford; $5-$10 at the door. The symphony matches Beethoven's Symphony no. 7 with 18th-century Italian composer Domenico Cimarosa's Il Maestro di Cappela. The Steinway Society June 25 at 2:30pm; Le Petit Trianon, 72 N. Fifth St, San Jose; free; 408.286.2600. The piano society welcomes Hu-Mei Lin and vocalist Peter Frost for a concert of English songs, German lieder and pieces by Bach, Debussy and Chopin. Sunset Concerts May 19 at 8pm; St. Luke's Church, 20 University Ave, Los Gatos; $10-$20; 408.254.4560. The Euclid String Quartet (subbing for originally scheduled Stefan Hussong) performs works by Mozart, Debussy and Brahms. The Valley Chorale June 3 at 7pm; Quinlan Community Center, 10185 N. Stelling Rd, Cupertino; $10/$15; 408.732.2588. For its 38th anniversary, the chorale, under the direction of Marian Gay and Cathy Beaupré, performs pop tunes and musical theater selections. West Bay Opera Friday-Saturday at 8pm, Sunday at 2pm, May 27-28 and June 2-4; Lucie Stern Theatre, 1305 Middlefield Rd, Palo Alto; $46/$50; 650.424.9999. The company concludes its 50th season with an ambitious production of Stravinsky's The Rake's Progress, a neoclassical opera in a Mozartian style, based on the famous cautionary series of etchings by Hogarth about a young's man's ruination from big-city temptation. The libretto is by W.H. Auden and Chester Kallman. The Winchestra Orchestra May 26 at 7:30pm at West Valley College Theater, Saratoga, and May 28 at 7pm at Trinity Cathedral, Second and St. John streets, San Jose; $5-$15; 408.269.1905. Henry Mollicone, who made a major splash this spring with his new Beatitude Mass, based on the lives of the homeless, leads his Winchestra Orchestra in Dvorák's Serenade, Holst's St. Paul Suite and Faure's Requiem.